Michele Bachmann – The Epitome! There are Lying Politicians and then there is Michele Bachmann. Every time this woman opens her mouth in front of a camera, the lies and blatant stupidity roll off her forked tongue faster than a used car salesman trying to close the sale. Paul Broun is the other Republican who lies almost as badly as Michele Bachmann. LIE: President Obama wanted to extend the Unemployment Benefits for those who have lost their jobs and it was the Republicans who stated that the only way THEY would agree to provide unemployment extensions would be if the President would agree to extend the Bush Tax Cuts. LIE: The Big Three received funding for a $25 billion government loan during October 2008 to help them re-tool their factories to meet new fuel-efficiency standards of at least 35 mpg-US (6.7 L/100 km; 42 mpg-imp) by 2020. We would like to remind Ms. Bachmann that it was in fact George W. Bush who approved the loans for the American Automakers, Not Barack Obama. Now in this same interview on the Today Show, Michele Bachmann stated that increasing the taxes on the Rich and on Corporations will not help to reduce the deficit and she claims that by doing this, it will only provide enough money to run the government for a few months. Additionally, Michele Bachmann blatantly LIED by saying the richest Americans are already paying 45% of their income in taxes. 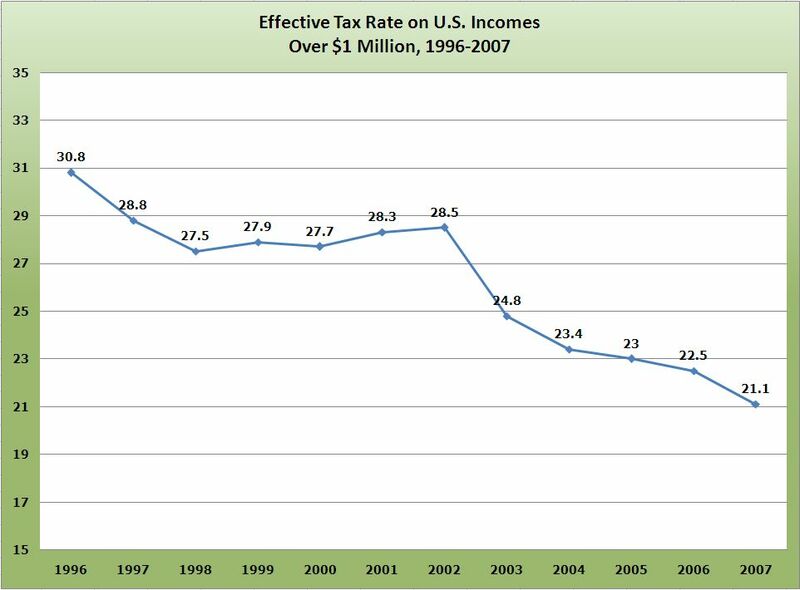 If we go back to even 1996 as we can see from this chart the tax rate on the wealthiest Americans are 15 points below what Michele Bachmann claims at 45%. As you can see the source for this graph data is the IRS, so just where is SHE getting her data from, FOX News? Since the Bush Tax Cuts were in effect in 2007 this final number of 21.1% is still valid today. Additionally, many wealthy Americans end up paying ZERO Taxes due to all the deductions and exemptions they can take. Here is just one article on the Christian Science Monitor of all places discussing this very issue. So Michele Bachmann is wildly exaggerating her numbers by over 23% and no one is calling her on it. 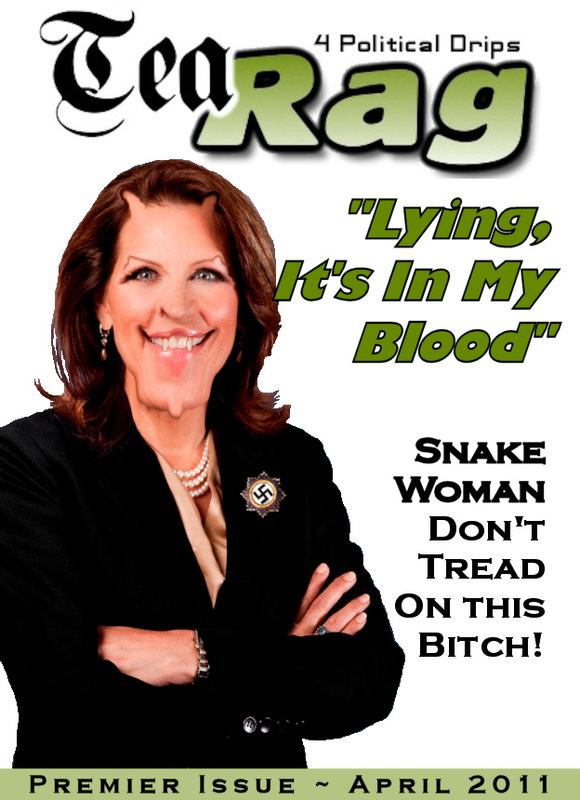 So WHY is Michele Bachmann LYING? Why is it a coincidence that the Republicans want to go after Social Security and protect the Wealthy? Well the answer is very easy, as the Republicans are on a crusade to destroy the Middle Class in this country by not only making the Middle Class carry the tax burden for the country, but taking away Social Security and Medicare while protecting the Wealthy. The top 10% in this country does NOT need Social Security or Medicare as they have the money and the means to pay for any medical expenses and to retire comfortably on their wealth and investments. Meanwhile the Middle Class in this country will continue to make less as the Infamous “Trickle Down Economics” give the rich the tax breaks to ship jobs overseas. This of course will leave nothing but service jobs and we are seeing this already. 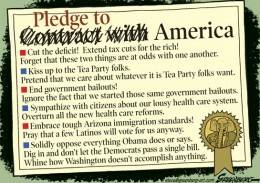 You have to hand it to the Republicans as it is a well devised plan to eliminate the Middle Class. If you are NOT in the Upper 10% of wage earners in this country, and you vote Republican, You may as well slit your own throat and be done with it! So this is Michele Bachmann’s contention that the Wealthy and all the Corporations in this country do not have enough money to help cut the deficit. Instead Michele Bachmann and the Republicans want you to believe that getting the money from “Entitlements” (Social Security & Medicare) is the answer. Why? 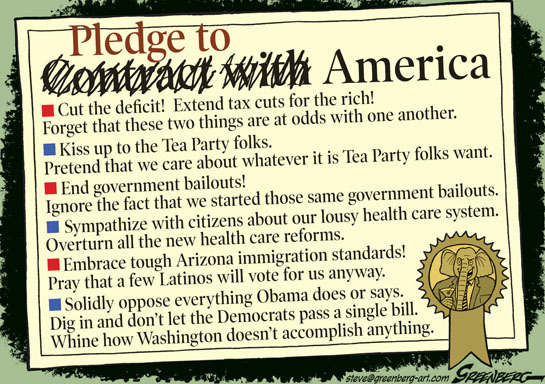 I’ve already told you why, they want the Middle Class of America GONE. Charts are provided by Mother Jones. You need to pay very close attention to these next series of charts starting with this one to the left. 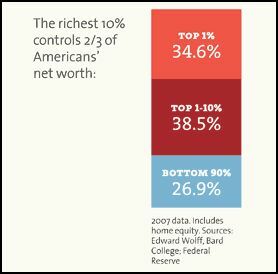 So Michele Bachmann wants you to believe is the Rich cannot help reduce the deficit. 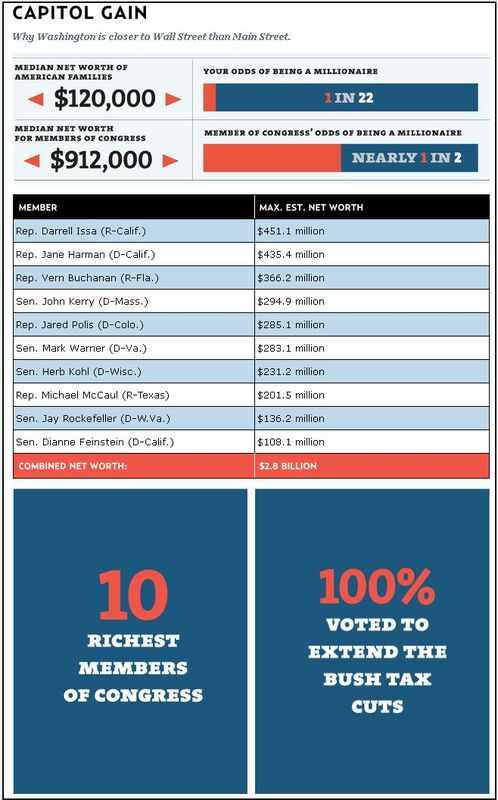 Looking at this first chart and coming to the understanding that the top 10% of this country holds 2/3 of the countries wealth, it becomes very obvious that Michele Bachmann is flat out LYING to you. How could 2/3 of this country’s wealth not capable of helping to reduce the deficit? If this cart below cannot show you that Michele Bachmann is lying in biblical proportions, then nothing can help you understand what is going on. 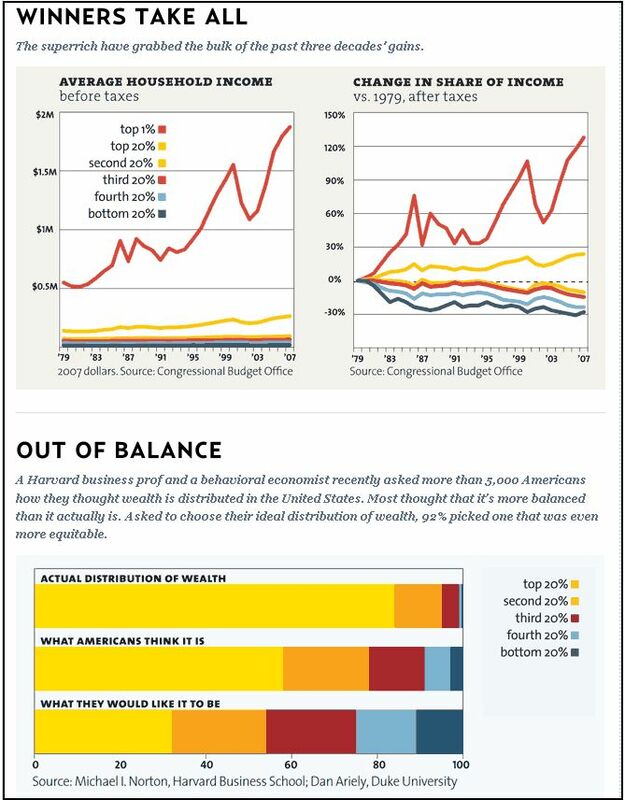 Just looking at the magnitude of the wealth disparity between the bottom 90% and the Upper 9% to the Upper 1% over the Upper 9% paints an overwhelming picture. Then keep in mind that the majority of the upper 10% does not really pay taxes. 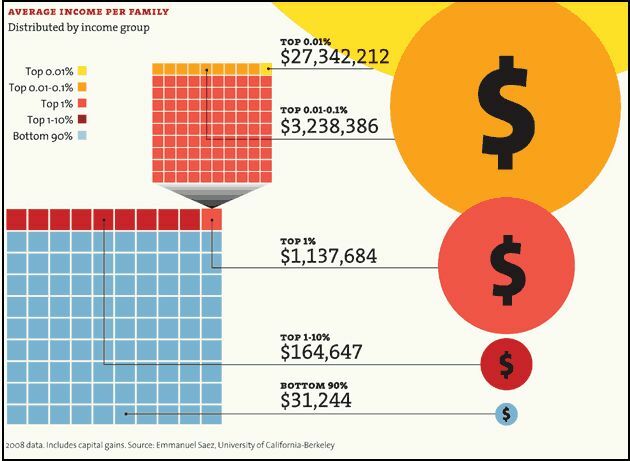 These Next Couple of Charts again show the huge disparity in the income in this country and yet Michele Bachmann wants you to believe that the Super Rich do not have enough money to help reduce the deficit. Finally we can see the other part of the reason why Michele Bachmann and the Republicans do not want to tax the rich and would rather use Social Security and Medicare to pay down the deficit… That WOULD take Money out of THEIR Pockets.